Referred to by Captain Cook as 'The Friendly Islands', Tonga spreads south of Samoa for 500 miles (800km); the 170-odd islands of the country comprise the Pacific's last monarchy and the only Pacific nation never to be colonised. Proud of their history, Tongan culture runs deep on the inhabited islands making Tonga a wonderful travel destination for those wanting a taste of authentic indigenous Polynesian culture along with their dose of tropical beach bliss. After a brief period of riots and political turmoil in 2006, when the locals rose up in protest against a new monarch notorious for his lavish lifestyle, Tonga has now reverted to its former peaceful, laid-back state. Although the country remains a constitutional monarchy there has been a certain amount of democratic reform in recent years. Tonga is considered a safe and stable travel destination with low crime rates and a welcoming population. Tonga is a choice destination for watersports enthusiasts and a tranquil retreat for those needing a break from the crush of modern urban life. 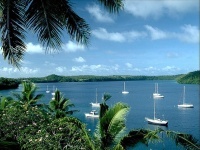 Yacht charters are popular for exploring the islands of Vava'u and Neiafu. Diving off coral reefs or snorkelling close to shore is available for beginners and experts on many of the islands. Tonga is also a celebrated surfing destination, but the reef breaks typical of the islands are not suitable for beginners. The presence of humpback whales in Tongan waters make it a sought-after winter holiday destination as well. The Tongan people are friendly and the culture generally relaxed, with traditional Christian values predominating, alongside older Polynesian customs. The capital and commercial centre of Nukualofa is a representation of this, with a blend of western and traditional influence evident in the vibrant markets thriving alongside crumbling colonial buildings and numerous churches. The capital city is on the main island of Tongatapu, which is home to about 70 percent of the population, but although travellers usually arrive at Nukualofa they are generally quick to seek out the less populated islands where pristine beaches and laid-back resorts beckon. Despite the obvious appeal of the archipelago as a travel destination, both culturally and scenically, Tonga remains largely unblemished by large-scale tourist development and has not been 'discovered' by package tourists. This may be discouraging for those looking for luxury but the ultimately unpolished nature of the islands is the main charm for many visitors.